Tip — Fred.\ has already defaulted the region of this search to find Caribbean Cruises. Refine your criteria and hit search. The Caribbean offers a scattering of beautiful islands all worthy of a cruise visit. The Caribbean is a destination that is renowned for its glorious, white sand beaches coupled with a vibrant culture. With a wide choice of luxury resorts, you could opt for a warm welcome in Jamaica or be greeted by the dazzling beaches of Saint Lucia. Fred.\ will be happy to tailor-make you fly cruise from Fort Lauderdale. Fort Lauderdale welcomes the seagoing traveller with seven miles of perfect beaches, making it the perfect port to extend your holiday on land. Renowned for sun and water sports, the city also offers fine shopping along the River walk and a perfect jumping-off point for a tour of the Everglades. If it's beautiful islands that you are after, then why not take a look at our wonderful Hawaii cruises that are sure to take your breath away in a very similar way. In response to Fred. Olsen’s hugely popular return to fly-cruising in the Caribbean, they are launching a new programme of 2015/16 itineraries, with not one, but two fantastic longer adventures to this seductive hot spot. You need time to truly appreciate the outstanding beauty, culture, and variety of this region, and that’s what these cruises give you. Escape the damp, grey, miserable British winter for something much more appealing. Sun-kissed beaches, soft white sand, cobalt waters, relaxed culture and the vibrancy of the Caribbean await – with a dash of exotic excitement thrown in for good measure. So, relax, unwind and float away to the Caribbean on your dream holiday. 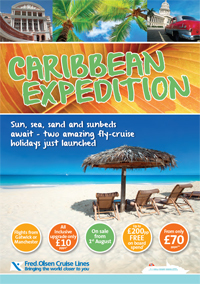 Can you resist the beauty, warmth and seduction of the Caribbean – especially with these special launch* prices? In Antigua you will be able to explore the coral reefs, miles of secluded, sandy beaches and coves. On shore and off, Antigua is one of the Caribbean's best islands for spectacular sand-and-sun fun. The island of St. Lucia has a setting of tranquillity and natural beauty. Thriving coral reefs provide ample snorkelling and diving opportunities while the mountainous rain forest preserves offer superb hiking and bird watching. is a spectacular Caribbean getaway with plenty of British appeal and where cricket is still the national pastime. This tropical island nation offers awesome natural wonders, a fascinating and diverse history, and duty-free shopping beyond compare. The island of Dominica is an unspoiled Caribbean paradise. The vibrant, rich rainforest is home to rare birds, including Sisserou and Jacquot parrots. Streams tumble down mountain slopes and thread fertile valleys on their short route to the sea. St Maarten has some of the most amazing cuisine in the world. Nassau, the capital of the Bahamas, is lined with colourful colonial architecture and historic sites and the surrounding turquoise waters are abundant with marine life. Enjoy a relaxing fun filled day in the clear blue waters of Haiti. Presided over by mountains green and lush with exotic vegetation, and surrounded by sandy beaches. In the Virgin Islands you can explore a tropical dreamland replete with stunning beaches, clear blue waters, and rolling green hills. Meanwhile Aruba is the Caribbean, but with a charming rugged edge. Visit the Schooner Market and watch merchants sell exotic fruit and fresh fish direct from tiny boats. There's no need to guess how Grenada came by its nickname of the Spice Island, you'll scent it on the breeze. Here, more spices are grown per square mile than anywhere else on earth - so browse markets heaped in cloves, cinnamon and nutmeg. St. Vincent and the Grenadines are considered off the beaten path of the Caribbean Islands, but it is the lush beauty, rugged coastline and rushing waterfalls that attract visitors to this volcanic island. Jamaica is a sun-drenched canvas of blue-green mountains, white-sand beaches and turquoise waters makes this island nation one of the most wonderful destinations in all of the Caribbean. From the warm breezes that blow under cloudless blue skies, to the cool waters of the mountain streams that lead to the sea, and the fragrant flowers that drape the rolling hills, Jamaica entices her visitors with a feast for the senses.